Our opponents have spent the season in the top half of the table and have a five point advantage but we have two games in hand. They have lost their last two league outings and failed to take anything from Aberdeen on Sunday despite taking the lead and facing 10 men for an hour. Jim McIntyre’s plea for consistency is understandable. County have never won at Fir Park (touch wood!) and if they are to succeed this time it will be without their top scorer. Liam Boyce was the player of the month in December and has 17 goals to his credit already but a plaster cast protecting a broken hand will keep him out of the team. They will look to Curran and Gardyne instead. There is talk of ex-Motherwell man Paul Quinn returning to Dingwall but Aberdeen are likely to hold on to him for this weekend’s game. 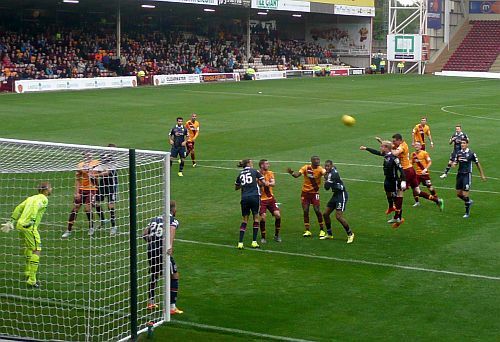 With Lasley now free of suspension we can expect a more familiar Motherwell team than appeared at Tynecastle. There are several candidates for the midfield place vacated by Grimshaw and there should be a return to the stable back four that was disrupted against Hearts. That would see Hammell back at left back with Law on the other side. A win for Motherwell would be the perfect response to the collapse last week and it will be for the players to demonstrate their determination to bounce back. With a vocal support cheering them on a 2-1 success should be within their grasp. Remember the last time Ross County were at Fir Park?